There was a crowd outside the cemetery gates. Tall men and women, warmly dressed against the cold snap. As Michael passed them he caught a glimpse of flattened faces beneath hoods, hats and scarves. They were Neanderthals, part of the community that had grown up in Longsight over the past decade. To social scientists it was a fascinating insight into the formation of communities. To Michael it was one more minority interest complicating his constituency. “This way, minister.” Cowley, his slender and obsequious assistant, led him through the gates, snow crunching beneath their feet as they strode towards the cemetery manager’s office. 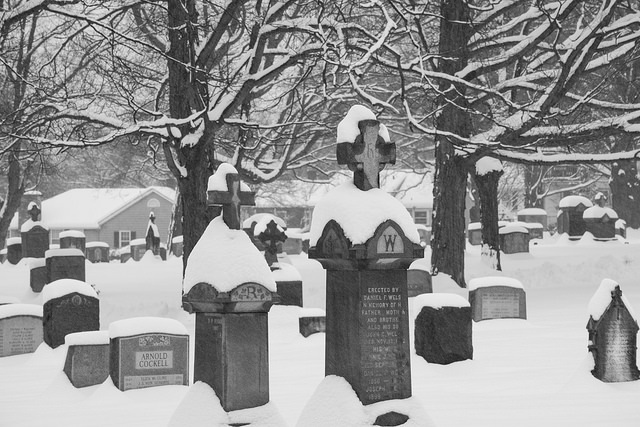 Despite the cold and the intimidating presence of the crowd around the gates, relatives had been in to pay their respects, and flowers lay amid the snow on several of the graves. “Thank you.” Michael never knew how to respond. What could you say? No words would ever bring his husband back. She settled down into a padded grey chair, and Michael took the one opposite. Cowley lingered outside the door making phone calls – the business of government didn’t stop for personal tragedy. “Do you think she isn’t?” Boyd pointed out through the glass doors, past Cowley, to where an aging Neanderthal in a long coat was placing sunflowers on one of the graves. “But the test is for being a true human.” Uncertainty and grief made Michael wobbly on his feet. He leaned against the door, forehead pressed to the cold glass. A sense of conviction rose in Michael, one he hadn’t felt since his first election campaign. He stood up straight, turned and shook Boyd’s hand. He opened the door and strode out into the snow. Cowley, seeing his master spring into action, snapped his phone shut and scurried after him. He joined the crowd, making eye contact with each quiet figure in turn, falling into the moment of shared sorrow. Tears ran down his cheeks, yet he felt a lightening of his burden, a sense of release. He pulled out his own phone, found a picture of Chris and showed it to the Neanderthal next to him. The Neanderthal pulled a picture out of his pocket, a smiling Neanderthal woman in a flower print dress. They stood together in grief. This story was suggested by my friend Lynda, who thought I could take inspiration from a radio program about evolution and the fact that we now have full DNA sequences for at least two different hominid species besides ourselves. I already have a few ideas for future flash Friday stories based on other people’s comments, but if you have a suggestion then please leave a comment and I’ll add it to my ideas list. It’s always good to get more ideas. If you enjoyed this you might also like my other Flash Friday stories, a growing collection of very short fiction. And for more science fiction stories, check out my ebook Lies We Will Tell Ourselves. Hah! You know someone mistakenly called me Lydia this morning. *applause* Well done Mr K, very nice. Thank you. And no I didn’t, but it seemed a natural choice. Previous Previous post: The short story market – what next? Next Next post: Who’s the Hero?